The New Rules for Creating a Career that matters and Doing Work You Love is a collection of powerful stories and proven strategies designed to help you create or find your own dream job. 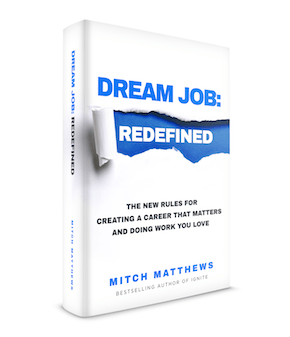 It comes from the 200+ interviews Mitch did with people who found work that mattered and shaped a career they now love. These are concepts that you can apply immediately so you can get clear, define your dream job, then go out and get it! 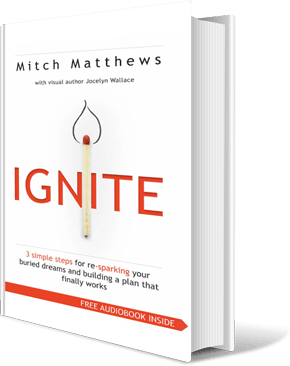 In this updated and expanded version of IGNITE – Mitch added a BIG Dream Journal so you could keep track of those dreams and goals for 52 weeks! 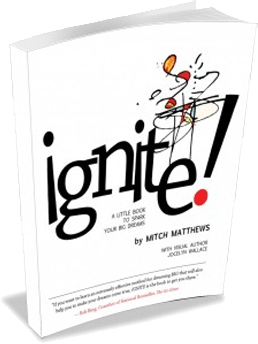 IGNITE Graphic CoverThis first edition of IGNITE explodes with full-color photographs and inspiring design as well as simple but powerful strategies to help you to get clear on your big dreams and achieve them!